Not so long ago, once you’d installed a traffic camera, you were pretty much stuck with the setup. The ALPR functions were fixed and left to perform their duty – for better or worse. Now, within MAV’s range of Rapier cameras, settings can be fine-tuned and adapted in real-time by remote or integrated ALPR engines to give the best recognition possible. MAV Systems build ALPR cameras for partners around the world and are at the forefront of this new, intelligent camera technology. 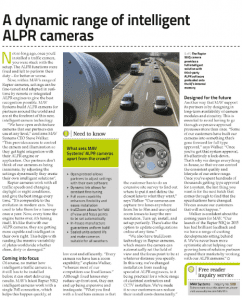 What sets MAV Systems‘ ALPR cameras apart from the crowd?